Over the years, I have noticed a certain pattern when it comes to money and gold. For example, my father bought a house 30 years ago for $20,000, and today that house is worth $200,000. If my father did not buy the house 30 years ago, and just stored the money in a zero interest account, he would not be able to buy that same house today for $20,000. If he had stored the money into an interest based account, the stored money would have increased, but no way would it have increased enough to buy the same $200,000 house today. So why store money in a bank account, would it not be better to buy gold instead of storing money in an interest based account? What am I overlooking? I get the feeling I am overlooking something, otherwise everyone would be buying gold like mad instead of sticking money into bank accounts. As Michael McGowan says, just because gold has gone up lots recently does not mean it will continue to go up by the same amount. shows that if your father had bought $20,000 in gold 30 years ago, then 10 years ago he would have slightly less than $20,000 to show for it. 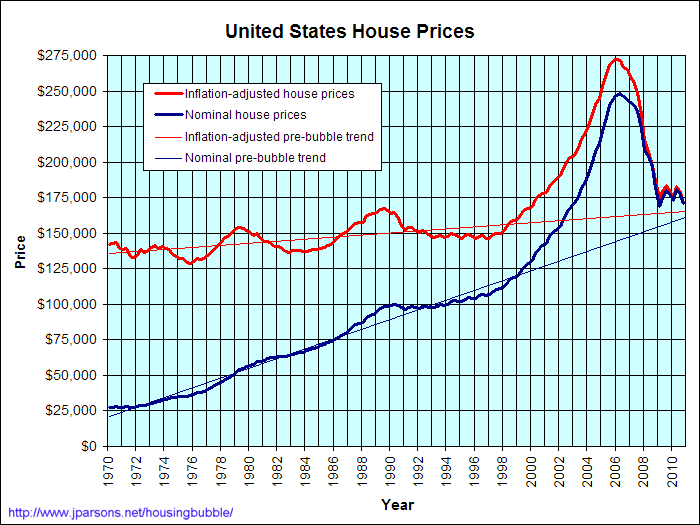 Update: I was curious about JoeTaxpayer's question: how do US house prices track against US taxpayer's ability to borrow? To try to answer this, I used the house price data from here, the 30 year fixed mortgages here and the US salary information from here. To calculate the "ability to borrow" I took the US hourly salary information, multiplied by 2000/12 to get a monthly salary. I (completely arbitrarily) assumed that 25 per cent of the monthly salary would be used on mortgage payments. I then used Excel's "PV" (Present Value) function to calculate the present value of the thirty year fixed rate mortgage. The resulting graph is below. The correlation coefficient between the two plots is 0.93. There are so many caveats on what I've done in ~15 minutes, I don't want to list them... but it certainly "gives one furiously to think" !! Update 2: OK, so even just salary information correlates very well with the house price increases. And looking at the differences, we can see that perhaps there was a spike or bubble in house prices over and above what might be expected from salary-only or ability-to-borrow. There's too much here for one question. So no answer can possibly be comprehensive. I think little of gold for the long term. I go to MoneyChimp and see what inflation did from 1974 till now. $1 to $4.74. So $200 inflates to $950 or so. Gold bested that, but hardly stayed ahead in a real way. The stock market blew that number away. And buying gold anytime around the 1980 runup would still leave you behind inflation. As far as housing goes, I have a theory. Take median income, 25% of a month's pay each month. Input it as the payment at the going 30yr fixed rate mortgage. Income rises a bit faster than inflation over time, so that line is nicely curved slightly upward (give or take) but as interest rates vary, that same payment buys you far more or less mortgage. When you graph this, you find the bubble in User210's graph almost non-existent. At 12% (the rate in '85 or so) $1000/mo buys you $97K in mortgage, but at 5%, $186K. 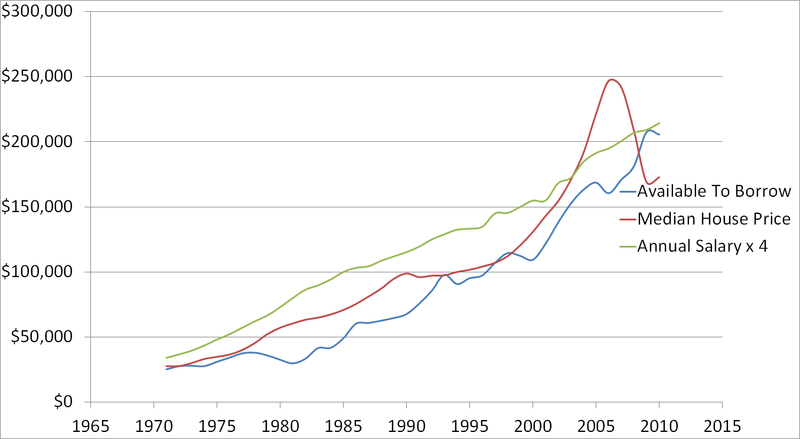 So over the 20 years from '85 to 2005, there's a gain created simply by the fact that money was cheaper. No mania, no bubble (not at the median, anyway) just the interest rate effect. Over the same period, inflation totaled 87%. So the same guy just keeping up with inflation in his pay could then afford a house that was 3.5X the price 20 years prior. I'm no rocket scientist, but I see few articles ever discussing housing from this angle. To close my post here, consider that homes have grown in size, 1.5%/yr on average. 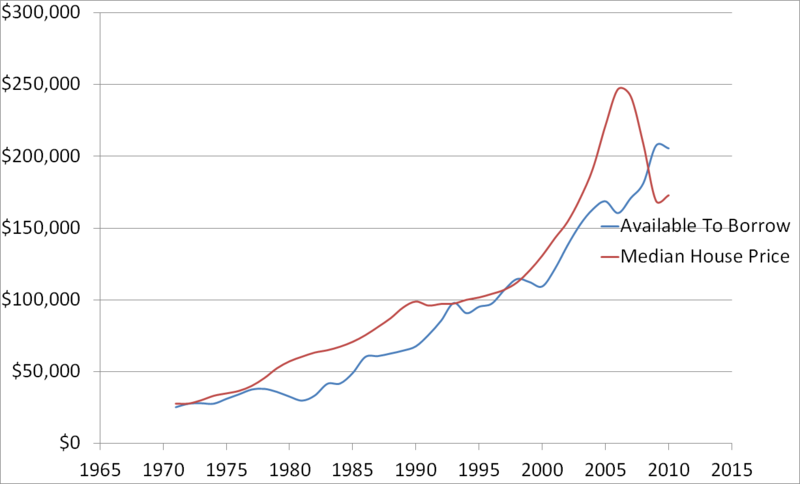 So the median new home quoted is actually 1/3 greater in size in 2005 than in '85. These factors all need to be normalized out of that crazy Schiller-type* graph. In the end, I believe the median home will always tightly correlate to the "one week income as payment." *I refer here to the work of professor Robert Schiller partner of the Case-Schiller index of home prices which bears his name. 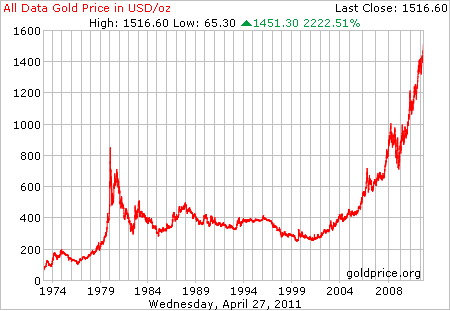 Just because gold performed that well in the past does not mean it will perform that well in the future. I'm not saying you should or should not buy gold, but the mere fact that it went up a lot recently is not sufficient reason to buy it. Also note that on the house, an investment that accrues continuous interest for 30 years at an annual rate of about 7.7% will multiply by a factor of 10 in 30 years. That rate is pretty high by today's standards, but it might have been more feasible in the past (I don't know historical interest rates very well). Yet again note that the fact that houses went up a lot over the last 30 years does not mean they will continue to do so. What you are seeing is the effects of inflation. As money becomes less valuable it takes more of it to buy physical things, be they commodities, shares in a company's stock, and peoples time (salaries). Just about the only thing that doesn't track inflation to some degree is cash itself or money in an account since that is itself what is being devalued. I'm with the others though. Don't get caught up in the gold bubble. Doing so now is just speculation and has a lot of risk associated with it. Not the answer you're looking for? Browse other questions tagged inflation interest gold savings-account or ask your own question.